A coffee classic, the Espresso Maker/Moka Pot produces an exceptional full bodied coffee flavour. Boil water in your kettle or in a pan. Unscrew the top of the Espresso Maker from the bottom chamber and remove the basket shaped coffee funnel by lifting it straight up. If it’s tricky to get hold of, you can tip it out by tilting the chamber on its side. Fill the lower chamber with hot water up to the level of the small valve. Fill the funnel with ground coffee, and give it a little knock or tap on the side, or use your finger to even out the grinds. Carefully place the funnel back into the bottom chamber and screw the top of the Espresso maker back on. Caution! The lower chamber will be very hot! You may want to use a kitchen towel to hold the bottom chamber while screwing the top back on. Open the lid. Place the Espresso maker on a low heat and wait for the coffee to start trickle through. If the coffee pushes through, turn down the heat. If the coffee barely trickles through, turn the heat up slightly. Take the Espresso maker off the heat just as (or just before ) it starts to bubble. Serve as a short espresso, or top up with more hot water for an Americano. Why Use a Stovetop Espresso Maker? 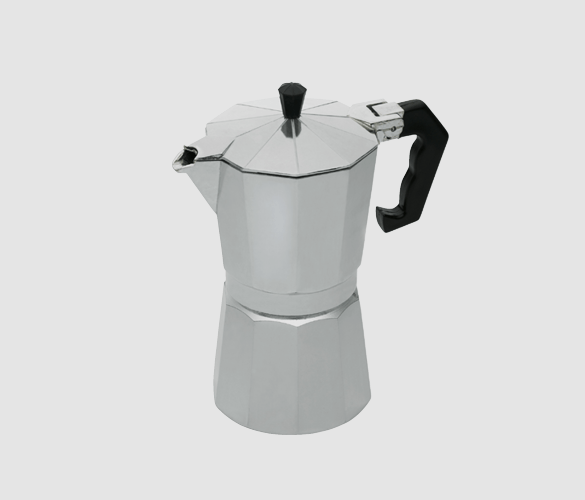 The Espresso maker, also known as a Moka Pot, produces a lovely and rich coffee. It is ideal if you like your coffee short (Espresso style) or rich with plenty of flavour. The characteristic coffee aroma that spreads in the kitchen during brewing makes us love it even more. The Espresso maker is suitable for all heat sources excluding induction. What Coffee Goes Well With the Espresso Maker? We recommend using a medium to full roast for your Espresso maker. Try the Cuba Serrano for a smooth cup with a sweet finish, or the Java for a darker roast and a strong, punchy cup. To experience the full flavour and freshness of your coffee, we recommend buying beans and grinding them at home. Grinding is the best way to get the freshest tasting coffee possible. This is because once coffee has been ground, there is a larger surface area for it to react with oxygen. Once it starts to oxidise, it slowly loses its flavour. We always deliver fresh at Adams + Russell and deliver as soon as we have roasted, however it is a great experience to try at home to experiment with your coffee routine. Take a look at our range of grinders which includes manual and electric options. Hi just had to write to say how pleased I am with the coffee percolator I bought from you at the Oswestry Food Fair. Makes a fantastic cup of strong coffee the way I like it. Since I started using it I haven’t bothered using my Dolce Gusto machine.